Preheat oven to 325F. Spray a 9-inch springform pan with non-stick spray, line bottom with parchment paper. In a heatproof bowl set over a saucepan of simmering water (bowl should not touch water), heat chocolate, butter and 1/2 cup sugar, stirring, until melted and creamy. Let cool slightly. In a medium bowl whisk egg yolks together, slowly drizzle in a bit of the chocolate mix to temper the eggs. Then add all the chocolate, mix together. Add flour and salt. Using an electric mixer beat egg whites until foamy, add sugar and beat until soft peaks form. Fold 1/3 of the egg whites into the chocolate batter to loosen, then fold in the rest. Scrape batter into prepared pan. Bake for 45 minutes, a tester should come out clean. Transfer cake to wire rack and let cool completely. Heat chocolate, butter and salt in a heatproof bowl ( bowl should not touch water), stirring, until melted. Whisk in powdered sugar. Meanwhile, bring wine to a boil in a small saucepan. Remove chocolate mixture from heat and whisk in wine. Remove cake from pan and flip bottom side up onto a wire rack over a rimmed baking sheet. Remove parchment paper and pour chocolate glaze over the cake, spreading it across the top and sides with an offset spatula. Let cake stand at room temperature until glaze is set, 2-3 hours. 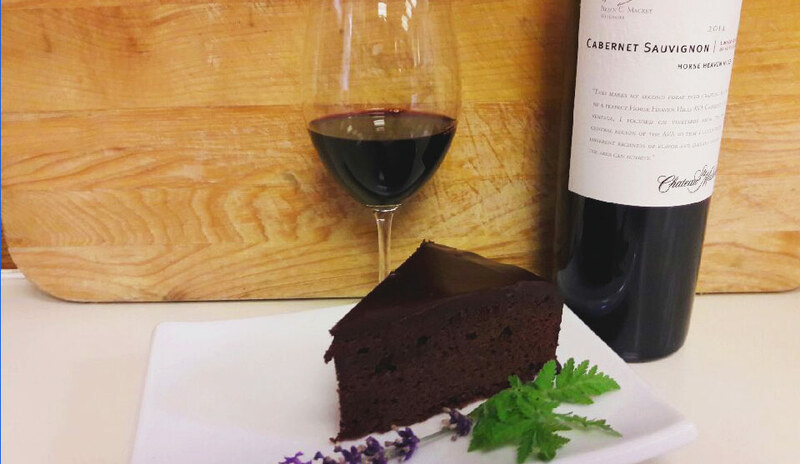 This dark chocolate cake pairs beautifully with a 2014 Horse Heaven Hills Chateau Ste. Michelle Cabernet Sauvignon.